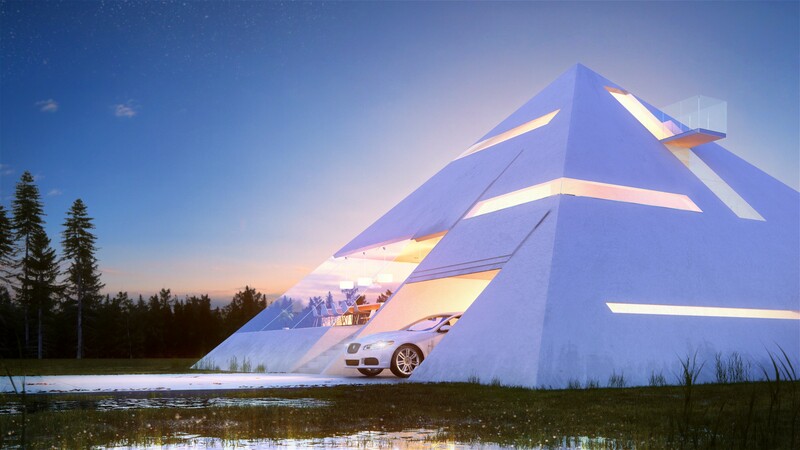 Some designs are driven by the plan, others by a concept, but this one is based on a shape – the question is: is a pyramid quite so perfect a form for a modern-day residence as it was a tomb for the rulers of ancient Egypt? Mexican architect and conceptual designer Juan Carlos Ramos decided to try and see, entering this piece into an architectural competition after a good deal of trial, error and experimentation. 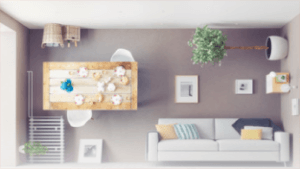 In the simplest terms, he started with shared common spaces like a living room and kitchen on the main floor and worked up toward more private areas, reserving the peak for a nice secluded library space. A spiral staircase wraps up to connect the various levels. Even a garage and balcony managed to make it into the master plan, accessed via a system of slot-like windows and sliding openings that maintain the continuous pyramid shape along the exterior of the structure. While the functionality of the form is somewhat debatable overall (the steep angles creating somewhat awkward interior spaces, not to mention construction costs), it would at least do a great job shedding dead loads during the winter and reducing wind loads in storms, being comprised entirely of angled surfaces.